If you just got from a beach vacation and now need a new shade of foundation, don’t freak out! Tan removal is now easier than ever with these quick DIY home remedies and effective products we are about to share with you. These easy hacks will help you get rid of the tan those endless sun bathing trips to the beach gave you. 4. Steam helps to reduce the face tan and how! First things first, you may have already burnt your skin because of lack of sunscreen, so protect it now! Prevent further tanning of your face and body by using an effective, full coverage sunscreen daily. Even if you are at home. Did you know sitting under a regular tube light causes tanning too? That's why the Japanese use sunscreens even at home! 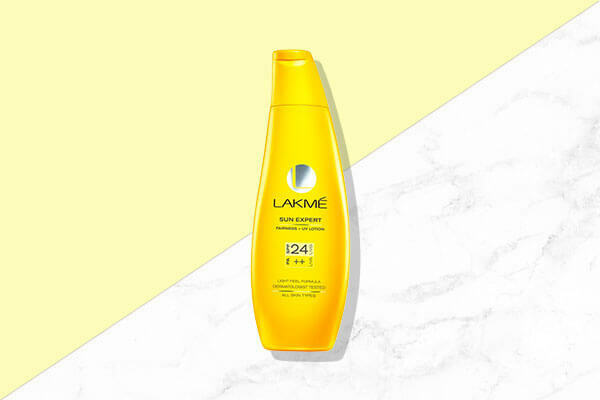 You can try the Lakmé Sun Expert Fairness + UV Lotion SPF 24 & PA++. variant for a full coverage protection against the sun. The best part about this sunscreen is that the texture feels light on the skin. Mix half a cup of gram flour with 1/4th cup of lemon juice and 1/4th cup of yogurt. Apply this mixture to your face and body 20 min prior to taking a shower thrice every week. Scrubbing your face and body helps to get rid of the tanned upper layer of the skin. Therefore as soon as you get home from your vacation, go for a scrubbing and spa session. Hit the nearest Lakmé Salon and get a face steam session. A hot steam opens your pores and gets rid of dirt that might have accumulated there. After your session, your skin will feel rejuvenated and definitely less tanned. Apply some potato juice on your face and keep it until it dries. Doing this every alternative day for 2 weeks will help you get rid of the tan completely. Mix 20 ml lemon juice, 20 ml or rose water and 1.5 tablespoons of glycerin. Apply this lotion in a soft, circular motion on your face before going to bed every night. You can see effective results after a week. Another salon remedy is to get waxed, even if you don’t need one. Waxing, like scrubbing will help to get rid of tanned, upper layer of your skin quickly. Body and face bleach help to lighten your skin too! These tips on how to remove face and body tan will allow you to add a couple of more bikinis to your shopping cart without any regrets.